Ground water is an essential resource providing drinking water for many of Maine's citizens. Because pesticides have been detected in some of Maine's wells, the BPC has collaborated with other agencies to develop a strategy to protect this resource. The Generic State Management Plan for Pesticides and Ground Water was developed in 1994 and revised in 1998. The plan's goal is to assess potential contamination problems, and once a pesticide is detected, assess the extent of the problem. Pesticide management practices are then implemented in response to identified contamination trends. The plan calls for statewide ground water monitoring every 5–7 years and the creation of pesticide-specific state management plans where needed. 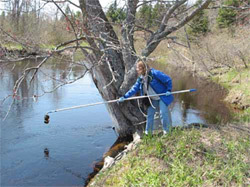 In response to many low-level detections of the blueberry pesticide hexazinone in ground water in some parts of the state, BPC developed the Hexazinone State Management Plan for the Protection of Ground Water in 1996. This plan outlines the duties of cooperating agencies, hexazinone best management practices and hexazinone ground water monitoring to occur every 4 years. 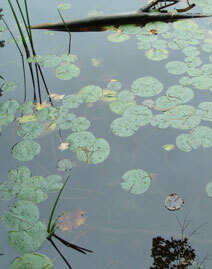 In addition to ground water monitoring, BPC conducts a number of surface water (lakes, streams, etc.) sampling studies looking for potato, blueberry, corn, right-of-way and residential pesticides. Reports on surface water findings, as well as ground water findings, can be viewed below or obtained by calling the BPC at 207-287-2731. BPC staffer collects a water sample.